Unfortunately we had not much cargo to exchange in Dakar, so we stayed just few hours there and we couldn't leave our ship. The crew told us that going offshore to Dakar is usually no big deal, it is pleasant and relatively secure there. 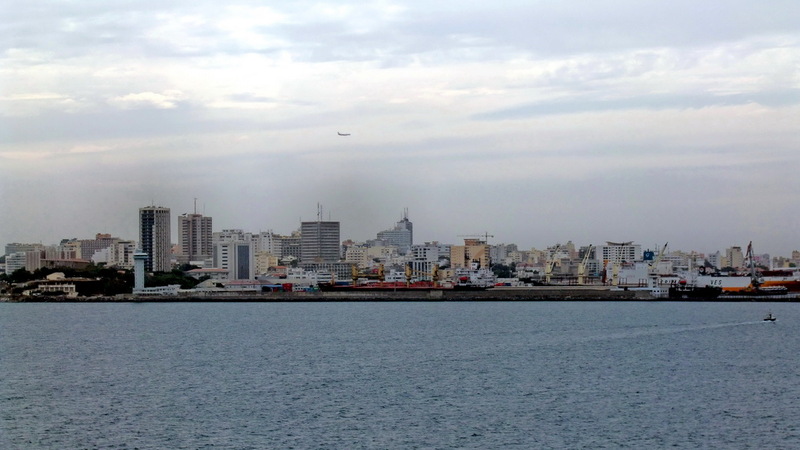 But we had a very good view to the skyline of Dakar. It looks very western! 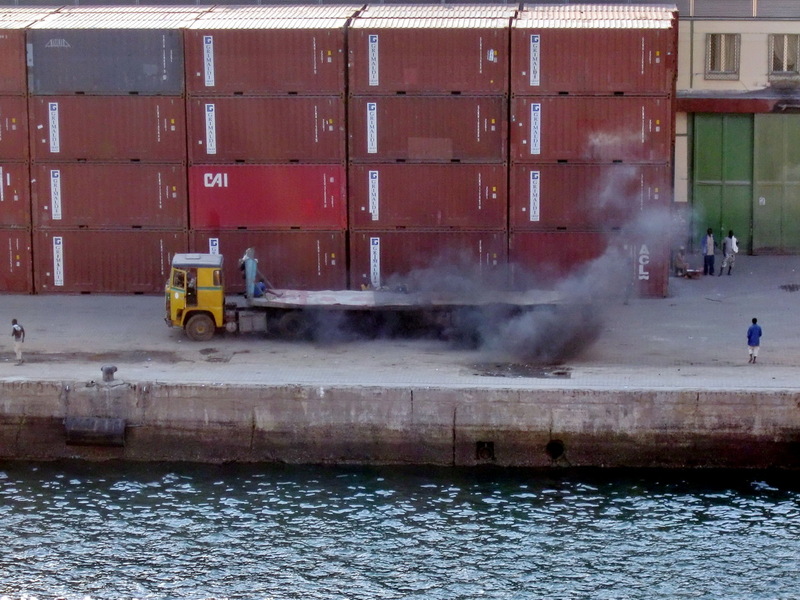 The port was clean and tidy. The people were well dressed and the cars looked proper. Also the offload of our cargo seemed very well organized, so we could leave the same day. No second hand cars were discharged from our vessel. Also we got some fresh food, mainly fruits and vegetables. 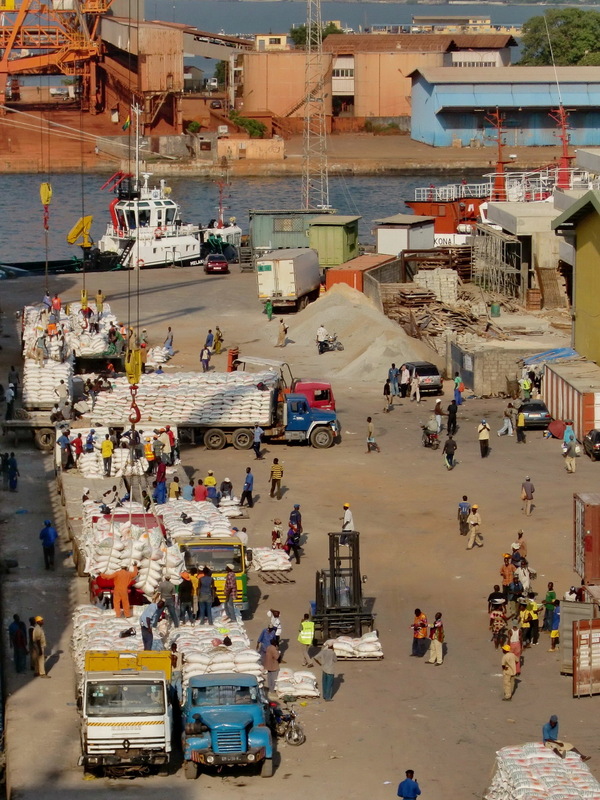 The crew was a little nervous about our next stop in Conakry, Guinea: Two members of the crew, who had watched the entrance of the vessel, had been attacked the last time they had stopped in Conakry. So we were also a little bit tensely. Our captain had the intention to arrive in Conakry early in morning and departure in the evening at any time to avoid staying the night there. But when we saw the port the two piers for such a vessel were already occupied by one of our daughter ship, the Repubblica Ghana, and by a rice freighter. Bad luck! We had to wait few hours and anchor in front of the port. 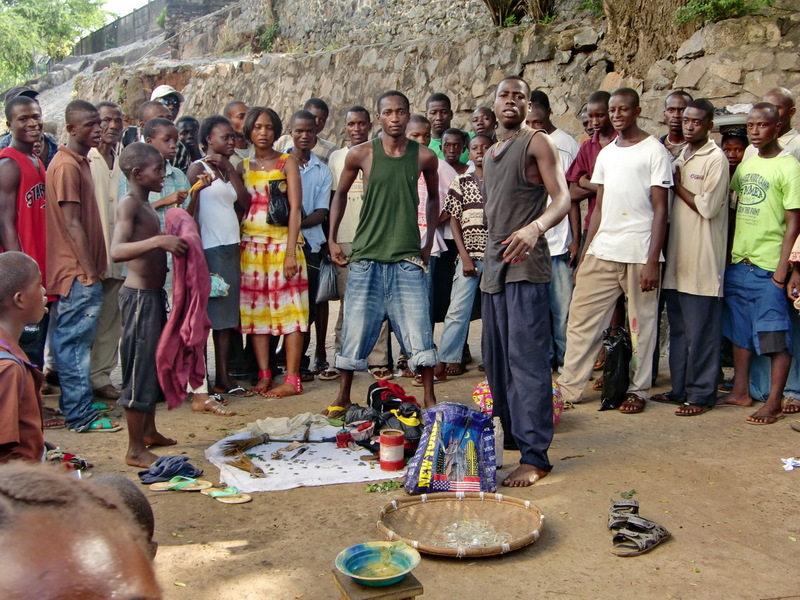 Finally we arrived in Conakry around lunch time on December 18th 2010. 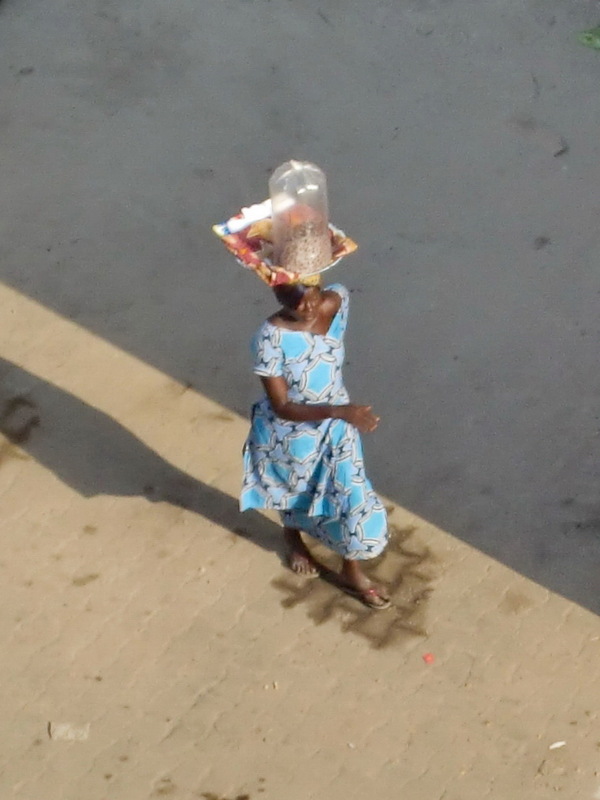 Conakry is incredibly, the exact opposite of Dakar: Chaotic, noisy, dirty, smelly, hot, ... Africa pure! Our idea was to go offshore. Our assistant checked it, but we should pay € 60.00 per person for spending half a day in Conakry. In addition the immigration process needs more than 2 hours. Makes no sense and consequently we decided to skip our offshore trip with a heavy heart. Instead we were staying the whole afternoon outside on the top deck and watching the chaos under and besides us. We were so fascinated that we totally forgot the heat. Our neighbor ship had an enormous amount of rice sacks to offload. A lot of empty big African trucks were waiting, driving always back and forth with people hanging on them. It was so narrow that it was difficult to turn the trucks. Suddenly big forklifts with containers swirled around. The trucks drove under the containers on the forklifts. The containers were placed somewhere in the middle of the area, so it became even more difficult for the truck drivers to turn their vehicles. Many people were in this area, besides or in front of the driving trucks and forklifts, under the containers, on or under the trucks and forklifts. They were walking, driving their motorbikes, discussing, eating, washing themselves in the ocean, sleeping, shitting, collecting rice out of the dirt from fallen sacks, ... We were not able to realize any order. It was very impressive to watch the African Ladies: Most of them wore very nice traditional African dresses. They carried a lot of stuff on their heads like oranges, vegetables, bred or water. In contradiction to the women most of the men had western clothes. A lot of African people came on board, especially before lunch or dinner?! Fortunately everything was locked; also deck 4 where our camping car had been stored. 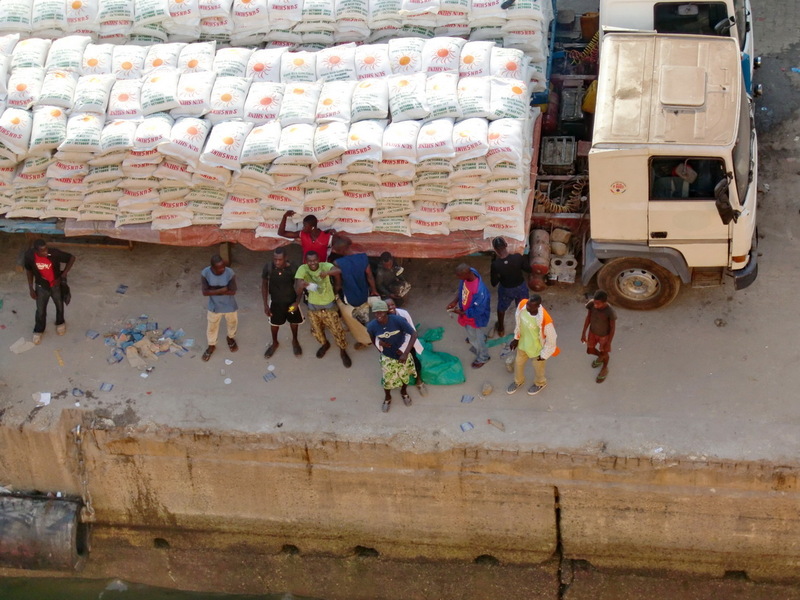 Some of the African men supported our crew to offload the 2nd hand cars for Conakry from the top deck. There was a lot of excitement on the pier, when the first cars arrived in Africa. 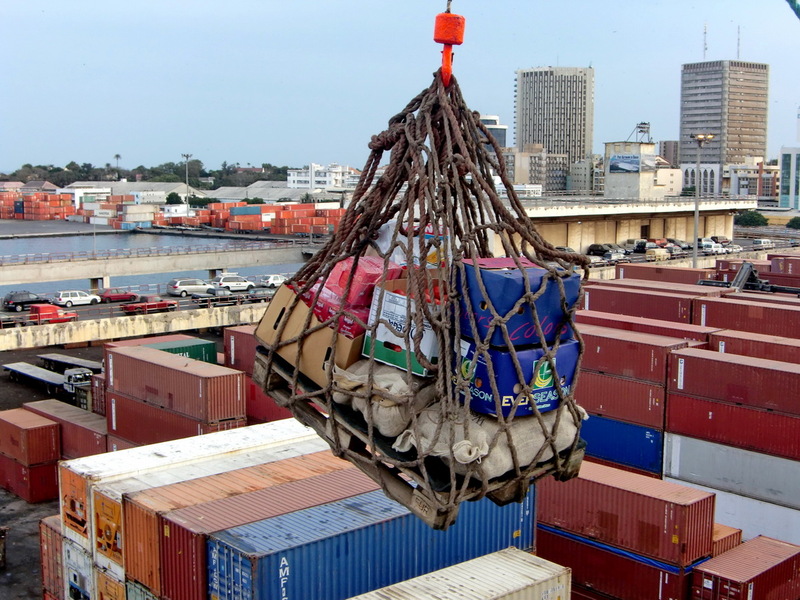 The crew worked nearly the whole night to offload the containers and 2nd hand cars for Conakry. We were ready for departure on the next morning. But we couldn't start due to some missing papers. In the end it took another half day for the port administration to finish our paperwork. Finally we left Conakry in the late afternoon. 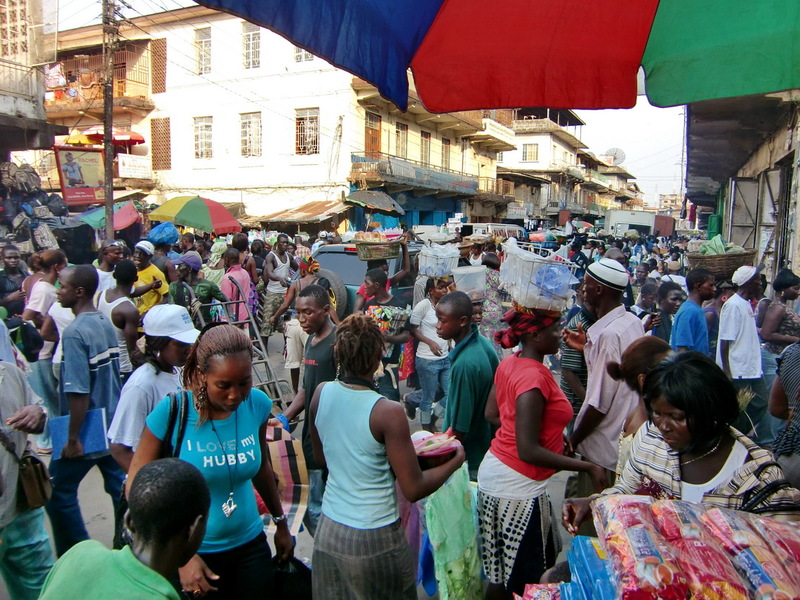 On the next morning we came to Freetown, the capital of Sierra Leone. We were able to go offshore after lunch. Only 5U$ per person and no special immigration process! We got immediately our 'Shore Pass', just a paper with our name, passport number, date and our vessel's name. We took our camera, some US Dollars and our Shore Pass. Marion hid her money, two 1U$ and one 20U$ notes in her shoe. Alfred had some 1U$ notes, distributed in all pockets of his trousers. We went from our vessel in the port building and crossed a bridge. At the end of the bridge somebody wearing a kind of uniform took a short look to our Shore Pass, and then we were officially in Sierra Leone! Of course self made guides were waiting for us. To avoid further discussions, we accepted two men in the middle age. The impressions were overwhelming us: Many kids, eager to get pictured. It was very pleasant, because they did not begging, they were just smiling. They were really happy when they saw their faces on the small screen of our camera. And the girls were beautiful and excited! 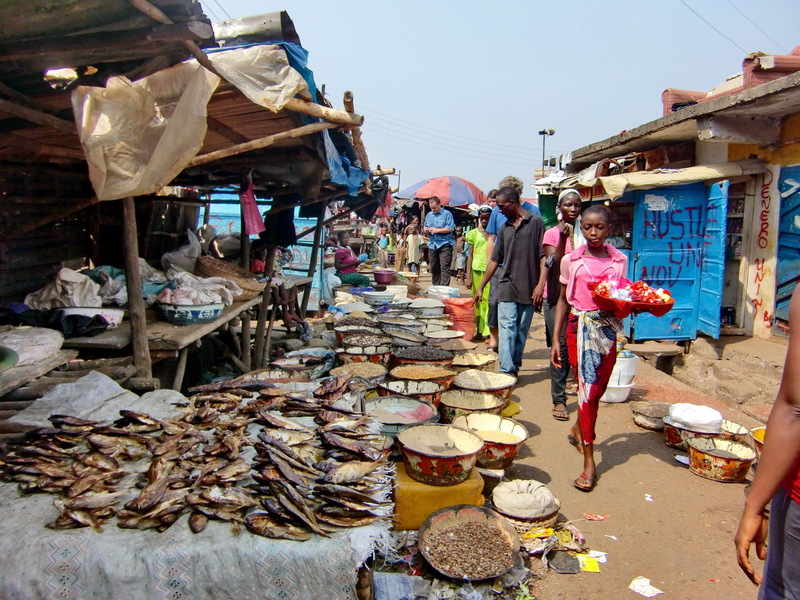 First we walked to a local food market, which had all African specialties like fish, beans, nuts, sorghum, different kinds of medicine,... And a lot of various fruits, some unknowns for us. We walked to the city center and suddenly a little boy asked Marion if he can have the money which came out of here shoe. 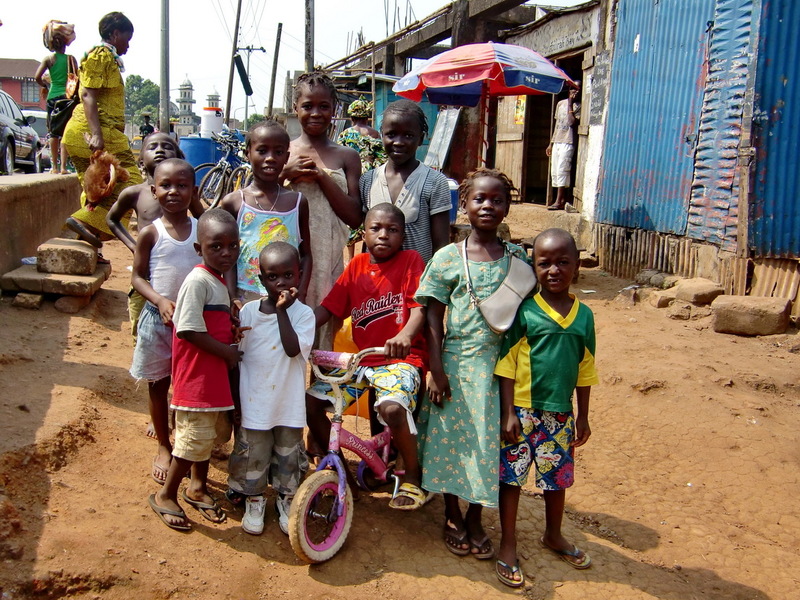 Very honest these kids in Freetown! After taking some refreshments in an African cafe, we decided to see some beaches around Freetown, which are supposed to be the nicest in West Africa. We took a taxi and this was a little mistake: Seven passengers, two guides and the driver in a regular car. It was hot inside and the petrol stunk horrible. At the beginning we had an acceptable speed (not more the 25km per hour), which provided us some air circulation. Soon we were stuck in traffic jams. Now the pedestrians were much faster than we. And we were stuck, and stuck, and .... Suddenly the engine stopped, running out of petrol. The driver cursed, took two empty canisters out of the trunk and disappeared. Of course now the traffic was moving. A lot of honking, we became nearly deaf. And some horrible over passing, because there was also heavy traffic on the opposite side of the street. Police came and asked angrily about the driver. We had no sufficient answer and they disappeared. After this incident we decided to leave the taxi and to continue by foot. Soon we saw a big crowd, and of course we had to know what's happening. Two men were telling fairytales. And Marion took some pictures of the crowd. Suddenly one of the teller picked big snake out of the basket. He shouted 'No pictures' and moved relatively fast into our direction. Marion was so afraid, that she ran away as fast as possible. Maybe it is a poisonous snake! Now our taxi came, the driver had somehow managed to get petrol. So we continued with the hope to see the nice beaches. But after few minutes we were stuck again in the heavy traffic. And the line in front of us was endless. Consequently we decided to skip the beaches. When we returned to the gate of the International port, Marion realized that her Offshore Pass was away. For sure somebody had grabbed in her pocket. We told the security guy that Alfred and Marion had just one. First he looked a little bit weird, but we both could pass. The Swiss couple was some minutes behind us. They told us later during dinner that the security guy had looked very surprised after they had presented two Offshore Passes! We were a little bit exhausted after our Freetown trip and very thirsty. 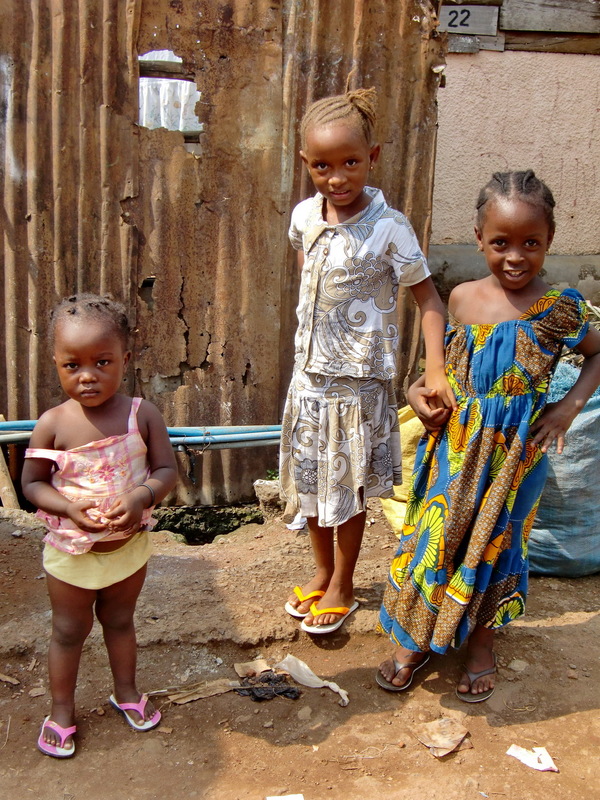 It was an amazing trip, and of course we want to come back to Sierra Leone. There was only one case we had had a bad feeling: Young men wearing military uniforms in a brand new SUV behaved very aggressively when we were in the crowd of the rush hour. They jumped the car, stopped it, honked, shouted and touched also some people. Some pedestrians became angry too, and knocked heavily at the door of the SUV. Fortunately nobody was hurt seriously! 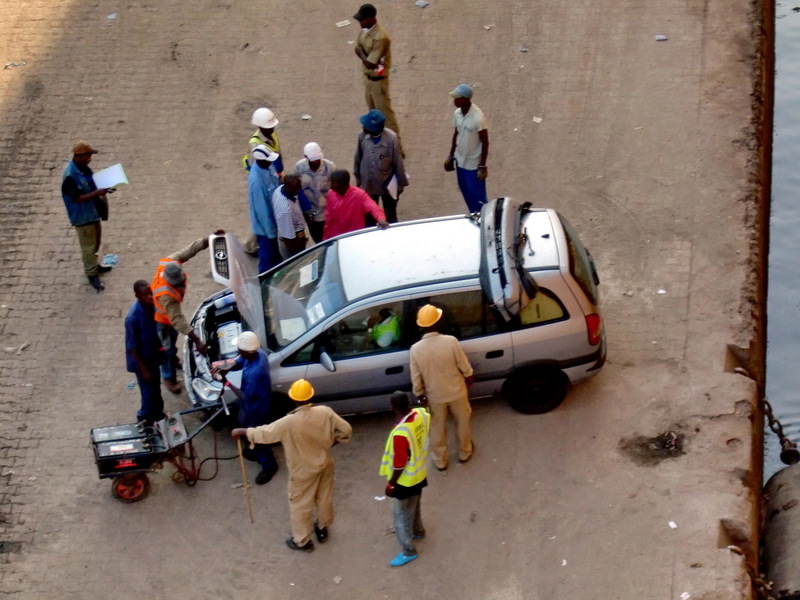 Besides this incident, we felt totally save in Freetown. 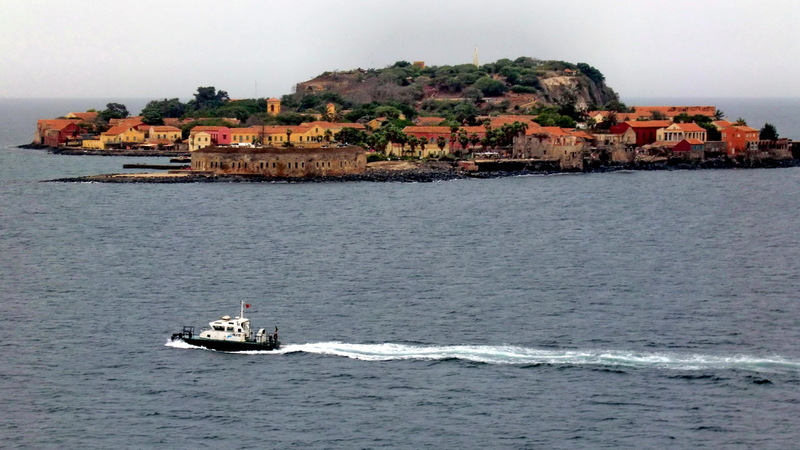 We left Freetown in the early evening of the next day. There was a lot of cargo to be exchanged. When we started eating the appetizer, the loudspeaker shouted extremely loud 'Fire - Abandon ship, Fire - Abandon ship, ...'. The face of our steward Massimo, became very white and he screamed : Oh, no, no, that's earnest, look at the ship. Massimo is a very young Napoli man, and it was his first time he serves on board of a vessel. We ran to our cabins, fetched our security stuff and returned to the dining room. Of course it was a false alarm to check if there is a stowaway on board. Fortunately nobody jumped into the ocean!